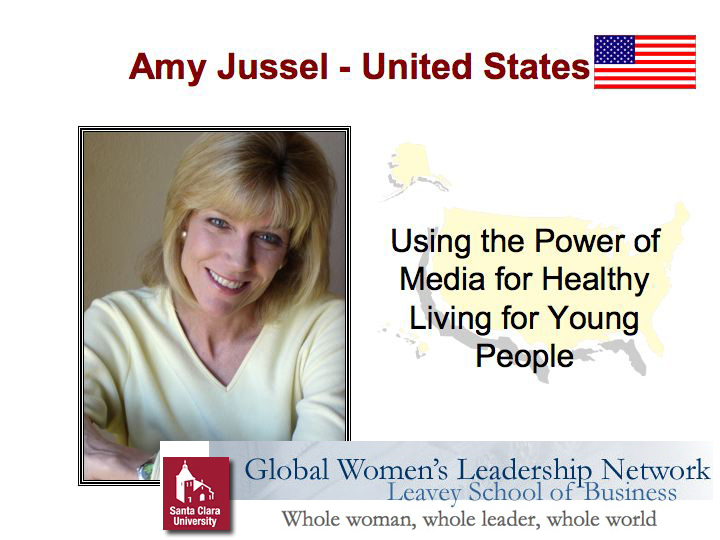 You are here: Home / Advertising / “Women Leaders For the World” Selects Shaping Youth! I’ve been trying to stay low key about being selected as one of the U.S. representatives for the Women Leaders for the World program, but after spending the last few days with my fellow GWLN delegates, (bios here) this is an intense global experience that will no doubt impact every iota of my very being. We’re leaving a damaging mark on the global landscape through exportation of our media and marketing mess on a variety of socio-economic and children’s health care fronts. Excessive teen consumerism conflicts with eco-concerns and mass consumption on the planet…Then there’s the impact on cultural consciousness, body image, physical/mental health and appearance cues twisted into complicated distortions played out in human behavior. Yowza. …Last stop of the day, we all hustled off to Portola Valley for the official GWLN reception with Cisco change agents and the like, where we all spoke of our visions and impacts, goals and funding needs. Suffice it to say, this week is very intense so the blog will be on a one week ‘hiatus’. Here’s more about GWLN and their amazing leadership team. Ratatouille: Great values, not cheesy, & healthy food messages too! Back in a week, unless I can score a minute of my own, but it’s not looking likely…This agenda is action-packed! MizPee Mobile Mapping: Where to GO on the go! OUR SUMMIT ENDS TODAY OFFICIALLY, BUT WE’VE EXTENDED TO CORP. SITE VISITS, VC CAPITAL FUNDERS AND NGO/NONPROFIT SECTOR LOCATIONS FOR 3 MORE DAYS TO GET SUPPORT SO I’LL BE BACK TO THE BLOG AUGUST 1! WE EXTENDED EVEN FURTHER UNTIL THURSDAY TO MEET GIRLS FOR A CHANGE.ORG, INTERNATIONAL WOMEN’S MUSEUM, GLOBAL WOMEN’S FUND, COMPASSPOINT AND MORE…BACK TOMORROW FOR SURE! Please, I will thank a lot to contact with people that would be working with DISABLED WOMEN AND CHILDREN.